La Gomera is situated west of Tenerife, about 28 kilometres from its nearest point. The highest peak is the "Alto de Garajonay", which rises up to 1,487 m.
La Gomera is a small island, yet it boasts a large variety of natural and man-made landscapes, a result of the complexity of its relief and of the notable capacity of its inhabitants for adapting to difficult terrain. Such efforts have succeeded in making the exploitation of it resources compatible with nature and environment, and have given rise to an indigenous rural culture, many of whose characteristics are still obvious today. 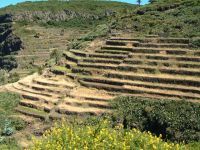 The scarcity of arable land has obliged the peasants to construct terraces, which have given rise to some of the most remarkable landscape of the island. They look like giant stairways and are fruit of the efforts of many generations of farmers. Thanks to both orographic and historical factors, this search for agricultural space has been compatible with the conservation of an important natural legacy. Nowadays fully a third of the island is protected by series of environment laws and judicial dispositions. The most important of these protected areas is the Garajonay National Park, remarkable for its Laurisilva. The natural beauty of the island is complemented by impressive cliffs, rocks, and palmgroves which dot the farmland and form numerous oasis in the ravines. The isolation of the island has ensured the preservation of numerous cultural traditions. Some of these, like the typical pottery, the peculiar "Silbo" a whistling language or the drum dance, originated with the aboriginal people. Others, like the native architecture, as in ours country houses, and cuisine, skillfully combine external influences with indigenous elements. 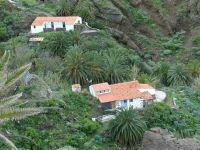 The rehabilitation of country houses for tourism, en collaboration with the Cabildo Insular of La Gomera, give to the visitor a unique opportunity of proximity with this inheritage, while enjoying the wonderful surroundings.